As promised in my Disney World Trip Report I am going to be doing dedicated posts on different parts of mine and Dan’s Disney World Trip, in the hope it helps or inspires you with your own trip. There are lots of really great properties to stay in off site but this post will focus on those within Walt Disney World. When you first start looking into your Disney World Holiday, choosing where to stay can be completely overwhelming. There are 25 different resorts and hotels owned by Walt Disney World, which range in price, location to the parks, luxury and those more budget friendly. They are broken down into three categories: Value, Moderate and Deluxe. A list of them all can be found here. All of the Hotels, no matter which category, are completely shrouded in Disney Magic & you would have an amazing time wherever you stayed but obviously the location, size of room, dining and grandeur of the resort would be higher as you go up the tier system. For me location was quite high up on our priority list, as it meant our bus journeys wouldn’t take too long getting too and from the parks. 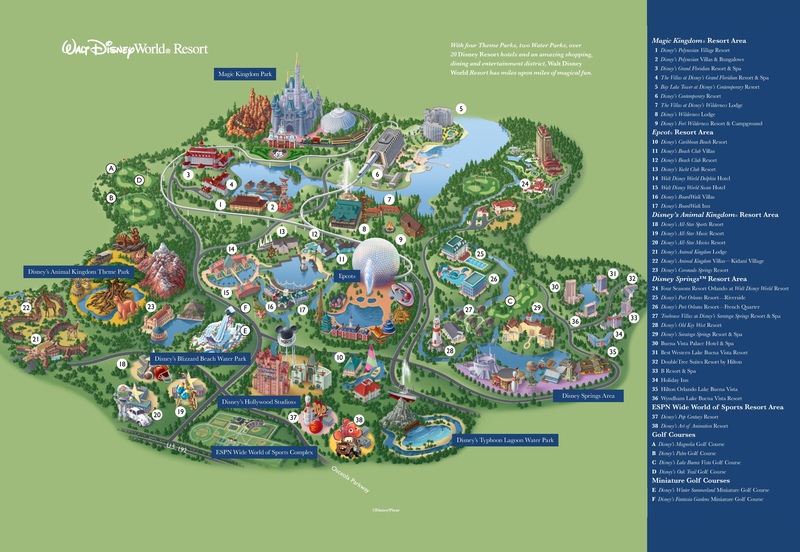 This map helped us understand where all the Hotels were in relation to the parks & other resorts. Click here for a bigger version. Dan & I decided to stay at Disney’s Caribbean Beach Resort, as it was close to Hollywood Studios, Epcot and Disney Springs. It is a moderate hotel, so the rooms were big, the transportation was good (lots of bus stops around the resort) and the pool area looked amazing. Before booking we were made aware of the construction happening at Caribbean Beach but were assured it wouldn’t impact us, it would only be happening during the day and due to us being in the parks all day we went ahead and booked it. We booked our Holiday as a package through Virgin Holidays but there are so many Travel Agents, as well as Disney themselves, that offer competitive prices. My advice would be to wait for deals on Disney Dining or general tour operator deals and compare prices between agents to get your best price. As you are able to save a fair bit of money this way. We absolutely loved our stay at Disney’s Caribbean Beach Resort however, I believe that could have been down to our location. CB is one of the biggest resorts on Disney World & this needs to be taken into consideration when booking as you could be allocated a room in one of the blocks quite far away from the pool & restaurant area. Centretown is where the main pool and restaurant are located, so if you were in the end block of Trinidad South, Barbados or Aruba you will have quite a walk to this area. We were located in Trinidad North, in the block right next to Centretown which was incredible. 100 yards to the pool, eating area and bus stop. If you are going to book, then 100% pre request a room here. The construction didn’t bother us at all but it was noticeable – the foodcourt was a lot smaller due to it so there was a bit of congestion during breakfast. The construction is said to be finished around fall 2018, so if you are booked later in the year or 2019 you will be fine and the revamped CBR looks incredible! The transportation was brilliant – we were the 2nd bus pick up so we never had trouble getting on this first bus (again another pro of being in Trinidad North), we often went past Jamaica & Aruba and people were having to wait for the next one. The buses say they come every 20 minutes but we never normally waited more than 5 minutes from when we arrived at the Bus Stop. The only problems we had were with the Magic Kingdom bus which didn’t turn up a few times meaning we had to get Uber’s to ensure we didn’t miss dining reservations… bit annoying. Overall, we had an amazing time at Disney’s Caribbean Resort it was clean, comfortable and we had an amazing location. I would definitely recommend but definitely request a room at Trinidad North!! Any questions about Disney’s Resorts, Booking or Disney’s Caribbean Beach Resort then please ask below! We stayed at Caribbean Beach just before construction started. We loved it and it had lots of things for kids to do!